EZ Productsd Mazzei AirJection System delivers dissolved oxygen economically to any depth in industrial and municipal water bodies needing complete water aeration. The AirJection System produces predictable, thorough aeration with out the use of troublesome, expensive, blowers or diffusers. Key applications are for odor control, activated sludge treatment, BOD/COD reduction, and H2S Oxidation. The four step recirculating process uses patented Mazzei Injectors to dynamically infuse the affected pressurized water with oxygen. It is then delivered to the bottom of the pond/tank/reservoir, under pressure, through Mazzei's patented Mass Transfer Multiplier Nozzles that multiply mass transfer in the surrounding water. Microbubbles then emerge and rise to the surface. 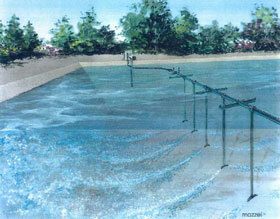 The system enjoys a small footprint and safe operation with no moving parts other than a reliable recirculating pump. The company's engineering staff assists worldwide customers with design and recommendations for each application based on treatment conditions and expectations.P> , PO Box 160655, West Lake Hills, TX 78716-0655. Phone: 888-5903030; Fax: 512-347-8141.